Derived from evergreen cajput tree of Malaleuca family, Cajeput Oil has extensive applications in Ayurveda and aromatherapy. The tree of cajeput is notable for its green, white and red flowers and pointed leaves. Cajeput essential oil is enriched with compounds like a-terpineol, limonene, myrcene, a-pinene, linalool, p-cymene, terpinen-4-ol, 1,8-cineole, b-pinene, terpinolene, y-terpinene, and a-terpinene. The refreshing middle note aroma of this essential oil resembles to the fragrance of camphor with slight touch of fruity smell. To be precise, its aroma is the amalgamation of the fragrance of cardamom, rosemary and camphor. This volatile oil is compatible with other essential oils like lavender, cloves, bergamot, thyme and geranium. 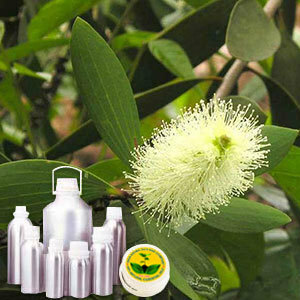 Cajeput Oil is also known as white wood oil and melaleuca oil. Cajeput oil is used as an important element for preparing herb based products and aromatherapy items. The anti bacterial and anti fungal properties of Cajeput Oil are acknowledged by doctors across the globe.